some explanation of the design, but does not detail everything. for the robot, and finally fine-tuning the robot. white, follow black lines, and recognise the cross sections. set, since we were in a hurry, and then adapted for our specific task. consideration. The standard robot was equipped with some light sensors for following the black line, and using some straight forward code, a few test runs were performed. Starting from the last point… the sensor placement was crucial to the effective movement of the robot. They needed to be close to the black line to ensure that the robot moves straight forward without zig-zag’ing, but still so far apart that the robot had time to react to the black line. The sensors should also be ahead of the robot, to increase the distance between the center of the robot’s turning point and the sensors, which increased the accuracy of the robot. At the same time the sensors could not get to far in front of the robot, since this makes the sensors move so fast, when the robot turns, that the sensor sampling rate becomes to slow. The robot simply doesn’t catch the black lines, when doing turns. 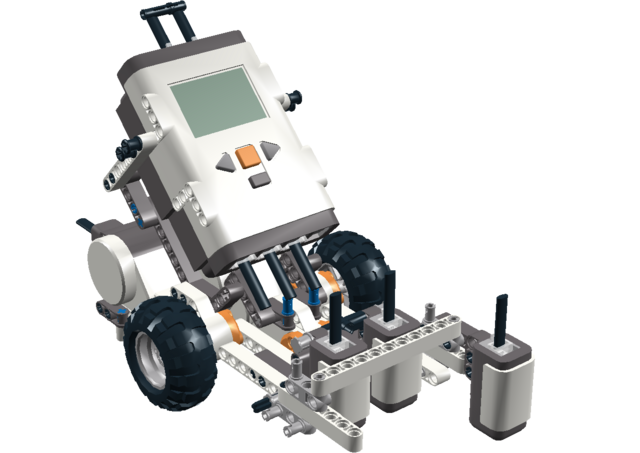 The placement of the sensors also influence the robots turning radius. To far ahead of the robot, and the robot would not be able to turn 90 degrees between to intersections of the lines, due to its increased length. The turning radius was also influenced by the motors driving each wheel. At first the robot simply increased stopped one wheel, while continuing to drive on the other wheel. This turned out to be inadequate for making the turns sharp enough, so we had to do something additional. We then experimented with letting the wheels drive in opposite directions, which of course decreased the turning radius a lot. This solution did give other problems, including making the robot move past intersections in a sort of stop-and-go pattern, but in the end we stuck to that solution. This video shows the robot being tested on a sample field. All the lines are unbroken in this example, meaning that there is no wall in this particular puzzle. You can see that the two sensors closest to the robot are used for following the lines, and thus controlling the robot. The front most sensor, which isn’t tested are only used when moving a diamond in the game, to ensure that it is placed right on an intersection. In the end it turned out that a few modifications were needed before the robot was ready for the real Sokoban puzzle. More about this in my next post. There is a report available on the complete development of the robot, and the path finding code used when solving the puzzle in this report: AI00 Sokoban Robot Report. The report has detailed chapter on the construction of the robot, incl. test of different sensor positions and different speed settings on the motors. My next post will be an introduction to the Java program used for solving the Sokoban puzzle. It’s also included in the report above.